Monasteries have long been appreciated as spiritual centers of peace and meditation, but they are also loved for their artisanal, handmade crafts—and food. The Trappist monks are famous for their delicious jams, cheeses, fudge, and “world’s best” beers. 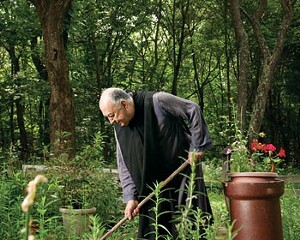 But Our Lady of the Resurrection Monastery, in LaGrangeville, and its Brother Victor-Antoine D’Avila specialize in something different: vinegar. 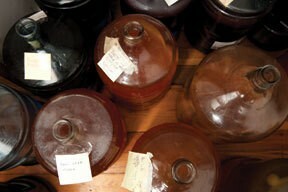 The monastery produces its organic vinegars using a special recipe with origins in the Middle Ages; it is the only producer in the Hudson Valley to follow this medieval method. Its variety of vinegars, which are crafted from red, rose, and white wine as well as pure local apple cider, undergo a process of slow-boiling followed by an eight-to-twelve-month period of fermentation, during which each blend takes on its own distinct flavor. 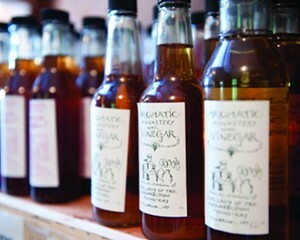 The vinegars, which are available in such varieties as apricot, raspberry, cider honey, and a rare sherry, have earned attention from restaurants and customers in New York and around the country. One of the monastery’s most popular attractions is its annual Vinegar Festival—which it will hold the weekend of July 12 and 13. The festival will be an opportunity to taste and sample the many available varieties as well as to learn more about their traditional fermentation process. In addition to its vinegars, the monastery’s event will feature products such as tapenade, pesto, tomato sauce, and apple butter, all sourced from its farm, gardens, and kitchen. Plants, books, and food products from other monasteries and local farms will also be available for purchase. 11am-4pm at Our Lady of the Resurrection Monastery, LaGrangeville.